This past month plus has been a very trying time for your author. In bed with lobar pneumonia and Type A influenza, feeling more miserable than one could imagine, racked with side splitting coughs, headaches, no appetite, and debilitating muscle soreness, my only respite - brief trips to Lake Hefner! My sweet husband treated me to brief tours around that lovely lake to see the waterfowl. Lake Hefner is one of five Oklahoma City lakes originally planned to help retain rain, snow, and ice melts in an area often hit with drought. This particular lake is the locale of one of the nation's finest public golf courses as well. "Lake Hefner was built in 1947 and is considered the premier location for sailboating in OKC. In addition to fishing, picnicking, and golfing, Lake Hefner is well-known for outdoor recreation. Trails trace the entire lake and stretch just over nine miles in total. They are 12 feet wide and covered asphalt, and the east side of the lake also contains some six-foot-wide trails specifically for pedestrians. The area features numerous well-kept parks for the kids, and you'll often find families walking, lounging, or flying a kite. The lighthouse is a photo destination, and the ​​​East Wharf restaurants offer some of the best views in the metro. "It sits in Northwest Oklahoma City, west of the Lake Hefner Parkway, as far north as Hefner Road, and south past Wilshire. It's also accessible from Northwest Expressway. "You can fish, sail (it's home to the Oklahoma City Boat Club), enjoy outdoor recreation trails, use picnic areas, go on playgrounds, use the enclosed and heated fishing dock, and play on the public golf course." "Originally constructed in 1919, Oklahoma City's Lake Overholser is the metro's oldest reservoir. It was built as a water supply to a still-operating water treatment plant at NW 6th and Pennsylvania Avenue. Named after the city's 16th mayor, it has several boat ramps, a covered fishing pier, and picnic areas. OKC Riversport operates its ​Adventures program at Overholser​ and offers kayaking, stand-up paddleboarding, and pedal boats. "It's in Northwest Oklahoma City, just southwest of Lake Hefner, south of Route 66, and north of I-40 between Council and Morgan Roads. "You can enjoy boating, water sports, fishing (there's a covered fishing pier), picnic areas with a covered pavilion, soccer fields, and tennis courts." The three other OKC metro lakes (reservoirs) are Lake Thunderbird, Arcadia Lake, and Lake Stanley Draper. One of our frequent outings is a birding tour of Lake Hefner. One is treated to a manicured expanse of lush green lawn over much of the park area, due to the professional maintenance of the two golf courses. Spanning the areas between are a lushly wooded expanse, parts of which are dense woodland and home to a wide variety of wildlife: fox, deer, skunk, and squirrel, to name the most common. Birds of many types are attracted to the lake, meadowland, pasture, and woodland areas. We see the greatest variety in the resident and migrating waterfowl. One of our annual treats is the arrival of the white pelican flocks as they make their way south for the winter. They are usually seen here starting in December and disappear about March. The dates are inexact, dependent upon the weather and the flocks' instincts. Often, there are a few who stay the full time, while the larger numbers complete their travel further south. Occasionally, the largest flocks are accompanied by Anahingas or Cormorants, or both. Here is a picture from my phone of a large mixed migrating flock of white pelicans and either Anahinga or Cormorants. I believe, Cormorants, because of the shorter, squared off tail. It is also possible all three species are represented. They were perched on the breakwater concrete which both absorbs and reflects sun heat. 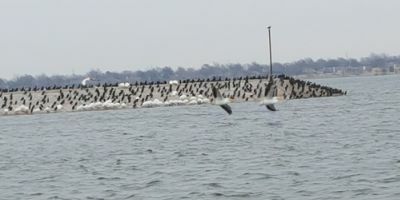 The entire length of the breakwater was covered, top, and both sides with the mixed flock. 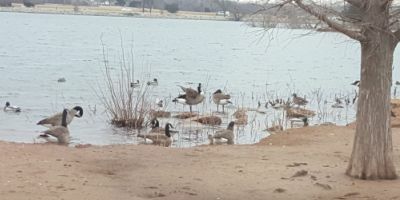 On the same day, a cove near the eastern edge of Lake Hefner provided comfortable feeding for Canadian geese, Mallard ducks, a Crested Duck, mudhens, and on shore a large number of gulls, grackle, pigeons, starlings, and even a handful of Robins. Here (1st pic) is a Cormorant, drying his wings. 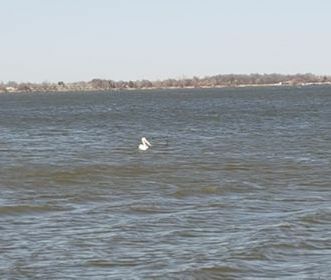 And here (2d pic) a sentinel Pelican on Lake Overholser. On the most recent trip from the doctor's, we found no pelicans or their Cormorant or Anahinga companions. We decided to drive to Lake Overholser. That lake was dotted over its entire length and breadth with our missing flock! 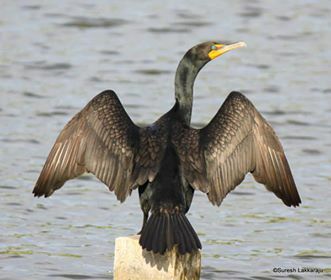 The bill color (quite orange on the Cormorant, black or blackish on the Anahinga) and tail shapes help to distinguish the two "cousins". Different flocks are present at Lake Hefner at different times of the year. In September of 2014, we were treated to a real surprise! It was my first view of these really odd looking ducks. They were large, with varied colors of feathers. Their one distinguishing characteristic even differed from one to another - the red "growths" that mottled their faces. 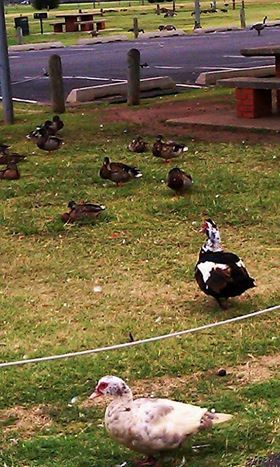 After some quick Google research, I was able to identify these Halloweenish birds as the exotic Muscovy Ducks. A small group of the large flock of Muscovy Ducks at Lake Hefner September 14, 2014. (First pic). Second picture shows the disparity in size between the Mallard and Wood ducks and the migrant Muscovy ducks. Third picture shows the Domestic Goose, the American Pekin duck (popularized as the icon Aflac Duck by the insurance company's ad genius), and a variety of Muscovy, Wood, and Mallard ducks. And, as my special photo offering, we were treated to a sighting of Swedish Ducks in 2015. They were present for several visits but I've not noted them since. 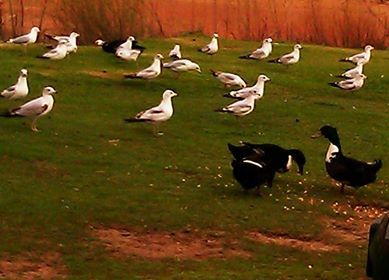 Here are two of the Swedish Ducks, with their varied plumage, grazing among a flock of gulls. These three Pelican pics were taken at the boat docks of Lake Hefner late last year in December 2018. Included here because they show how their gracefulness enhances them, turning the bird often thought homely to a creature of beauty. All many people know about the Pelican is the verse What a strange bird is the Pelican/ His beak can hold more than his belly can. These motor tours offer so much joy for the avid birder or aged outdoorsperson (both descriptors fit your author) as every trip to the lake or a wooded area provides a new look. Changing scenery blesses this lake with bright Fall colors, neon and lacy Spring greens, Summer lush cover, and Winter ice on bare branches spotted with the plethora of evergreens. The lake water sparkles or simmers under bright sun or grey clouds. 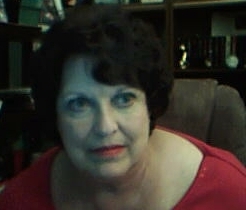 This month's column has been a treat for your author and, I hope, for you readers as well. Next month I plan to return in earnest to Armchair Genealogy and divulge the results of my research into another Patriot ancestor, this time on my Hempleman line (paternal).